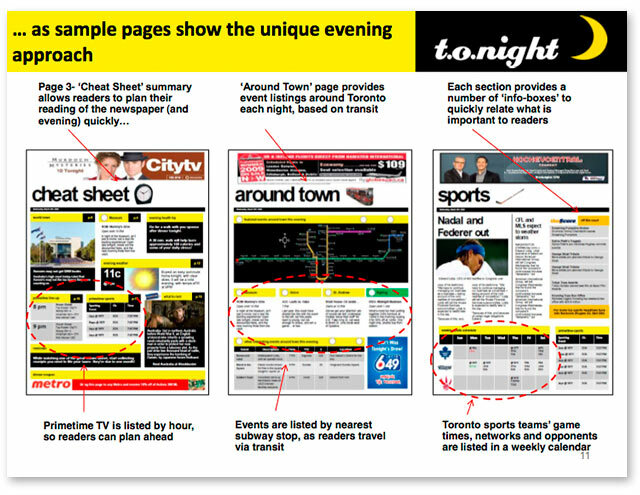 If and when it launches on September 8 this year, some 100,000 copies of t.o.night will be distributed downtown on weekdays between 3:30 and 6:30 p.m. through two delivery methods. A minority will be doled out from one hundred racks, many to be strategically placed just outside subway stations. The bulk, though, will be passed out by some fifty “handlers,” “high-school students dressed in the traditional ‘poor-boy’ cap with dress trousers and white oxford shirts” who “will also yell ‘Extra, Extra…,’ as similar handlers did in the 1930’s [sic], while promoting the days [sic] headline, to further the retro image of the brand.” T.o.night is all about retro: for brands like Steam Whistle and Johnny Rockets (cited by the paper as “‘retro chic'” influences), they say, “Harkening back to the past allows [them] to seem honest and straight forward—as many consumers look back to the era of these brands as simpler times.” With t.o.night, you too can remember the good old days, when Mom, Dad, Junior, Little Suzy, and Skip would all sit around the radio and listen to blogs on the internet. 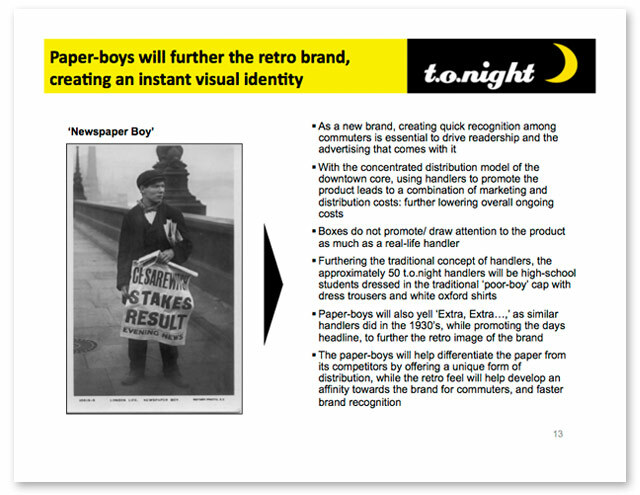 According to the June version of the kit that the paper sent to prospective advertisers, t.o.night is “a new venture with investments from St. Joseph Communications (Toronto Life)[,] Blackburn Radio & Private Investors,” though the relationship between t.o.night and St. Joseph is seemingly not that of paper and publisher, but of paper and supplier. (St. Joseph does publish Toronto Life, but that’s under their media wing; t.o.night‘s relationship with St. Joseph is described in the earlier kit as a “supplier & investor partnership.”) The latest version of the paper’s media kit, though, says only that the paper has “investments from a number of private investors including a number of print industry veterans” and doesn’t name any. John Cameron, t.o.night‘s managing director, clarified to Torontoist via phone on Monday afternoon that St. Joseph will be t.o.night‘s printers, and that all he could say about whether the organization will have a role beyond that is “I’ll get back to you.” [UPDATE, 11:30 a.m.: Cameron emailed Torontoist this morning to restate t.o.night‘s current relationship with St. Joseph Communications: St. Joseph’s print division is both an investor in and the printers of the daily paper. St. Joseph’s media division is not involved in the paper.] Most accurately, Cameron added, it’s also not Blackburn Radio that’s investing, but Richard White, Blackburn’s owner. 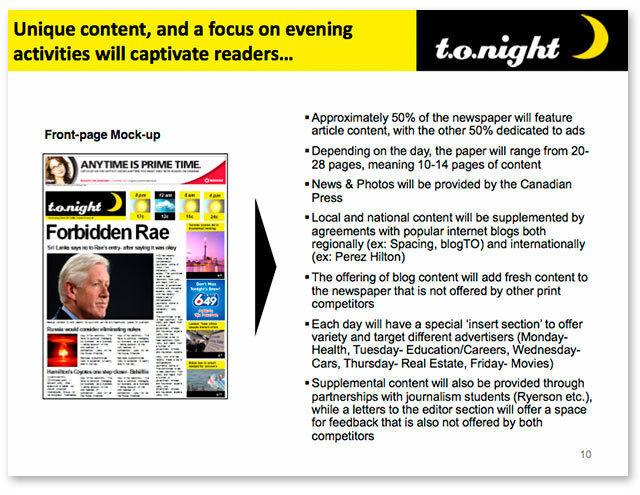 Slide from an earlier media kit, naming Perez Hilton as t.o.night‘s desired source of unique international news. T.o.night‘s earlier documentation optimistically suggested that Spacing‘s Wire would be joining BlogTO in providing the paper with content, which would be a puzzling move for a website already connected to such a strong print publication. 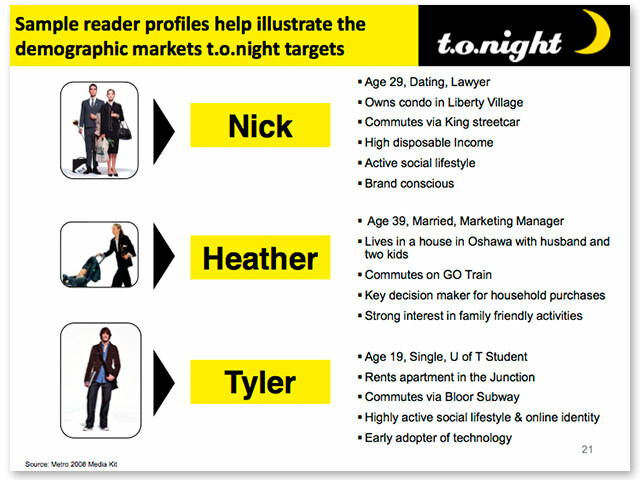 The latest version of the t.o.night kit omits them. (Spacing‘s publisher Matthew Blackett told Torontoist that “I know we’re used in their mock-up designs but that’s all there is to it between us.”) For BlogTO, it’s a good enough idea to hop aboard the t.o.night train, since there’s little to lose and lots of exposure to gain: they’ll have a “local news page” all their own in the paper, according to Cameron. But Perez Hilton? According to Cameron, neither Spacing nor Perez are officially on board, “but that would be a desire.” Perez—a celebrity blogger who doodles ejaculating penises on the photos of subjects of his posts—was the only blog listed in the original version of the kit as the paper’s provider of “international” news. And as we all know, if there’s anything Perez Hilton is good for, it’s accurately reporting international news. The plan is for additional blogs to complement the wire content from the Canadian Press, explained Cameron, so that a sports story from the wire would be printed alongside an article from a sports blog. But no matter who the blogs are, the inclusion of their timely content in a newspaper distributed hours later is still a fundamentally incongruous fit. In media, as in most things, form and content both work best when they go hand in hand. Things made for TV are often best-suited for TV; things made for radio are often best-suited for radio; things made for magazines are often best-suited for magazines. The internet may be the biggest exception to that rule: because it can cannibalize all other forms, it can successfully feature content that might have previously worked best for TV, or magazines, or newspapers, or radio, because it can be just (or much) like those mediums, and bring with it its own benefits. What’s hardest to figure out, though, is who t.o.night will be of most use to. If the aim is to give people fresh news from the wire—Cameron says t.o.night won’t be reprinting news already covered in other print publications on each day—there’s only so much that will break between when other papers hit newsstands and t.o.night‘s print deadline of 11 a.m., and there’s only so much that readers wouldn’t have already seen or read while at work. In print, events are already well-covered in NOW and Eye, freely available in or around most subway stations. The kind of commuter who reads blogs was probably already reading them at work, so there’s little value added to being able to read the same information several hours later without being able to interact with it. What’s more, BlogTO—no offense—aren’t doing much original breaking news reporting in the hours between when the other free dailies go to print and when t.o.night would: the site’s primary news content in the mornings is their news roundups, which (like ours) are aggregated from other media outlets’ original reporting. By the time t.o.night is in consumers’ hands, no earlier than 3:30 p.m., any stories in it, be they blog or wire-based, will be at least four and a half hours old, an eternity when all the paper’s doing is aggregating news that’s all available for free online anyway, news that people could easily check while at work and, if they really really wanted to read it later, print it off. Think about it like this. On Monday, news of a tentative resolution to the city workers’ strike broke, hours after morning newspapers had gone to press. (This is the scenario Cameron himself brought up to us.) If t.o.night was around, it would have been the only well-distributed print publication in the city to carry news of it. And it wouldn’t have mattered. After the morning papers went to press and until t.o.night did, anyone who wanted to know about what was going on with the strike wasn’t waiting for a print publication to tell them. They were online, or watching TV, or following Twitter, or listening to the radio, all far more immediate mediums than print. We asked Cameron whether it really made sense to launch a new print publication now. In spite of the relative competitiveness of free dailies, the model of printed daily news in general still seems to be in the midst of a slow and steady decline. Cameron countered that “newspapers are evolving,” pointing to radio as an example of a medium that was expected to die when a new invention came along—TV—but for which business models were found that succeeded. A combination of wire stories and blog posts are the future of newspapers, he explained, and t.o.night is “an evolution of the newspaper.” But the internet isn’t TV to newspaper’s radio; it’s everything to everyone, and, increasingly, it’s absolutely everywhere. Video killed the radio star, and the internet will eventually kill everything else. Besides, while we’ll have to wait and see for sure, as far as we can tell, t.o.night is going to be all or mostly rehash: rehash of news, rehash of blogs that themselves rehash other people’s news, rehash of event listings, a rehash of a business model that’s working intermittently worldwide but is totally untested in the last few decades here. In our phone call, Cameron mentions one possible original feature of t.o.night, frequent columns by “known Torontonians,” but that’s small comfort for a paper that, even if it succeeds, doesn’t sound as if it’ll be much fun to read. In other words, to use Tim Shore’s example, it won’t be anything like Dose. T.o.night wants to be retro, and they seem to have succeeded in one way: from its paperboys to its content to its creation of another newspaper in a world that is slowly but surely moving away from the medium altogether, there doesn’t seem to be much that’s fresh about it. 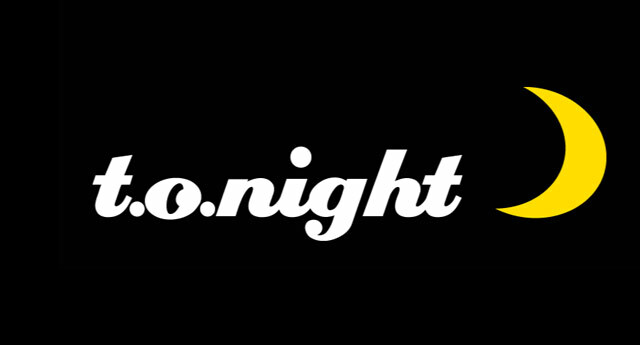 All images from t.o.night‘s media kit, save for the lead logo, from their website.